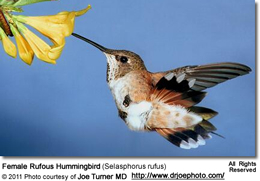 The Ruby-throated Hummingbird and Rufous Hummingbirds are amongst the most common hummingbirds in the United States. They occur in nearly all U.S. states. They share many physical features and can easily be confused. 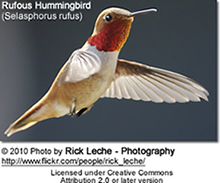 Rufous Hummingbirds (Selasphorus rufus) - Native breeders - One of the most widespread hummingbirds in North America that has been observed in every state and province except Hawaii, Prince Edward Island and Quebec. 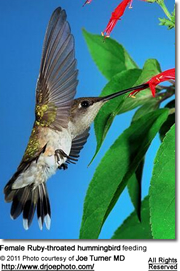 Ruby-throated Hummingbirds (Archilochus colubris) - Native breeders. Breed in southern Canada (central Alberta east to Nova Scotia) south to central and eastern USA (North Dakota east to Maine, and south to southern Texas. Vagrants travel as far west as California. 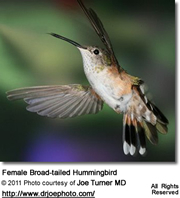 This species occupies the largest breeding range of any North American hummingbird. 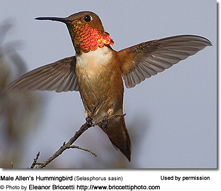 Allen's Hummingbirds (Selasphorus sasin) - Native Breeders. Historically, these birds nested in coastal California and wintered in Mexico; but more and more of them are remaining in California year-round or are traveling to the eastern United States for the winter. 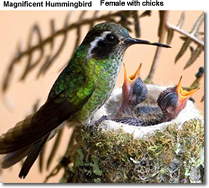 Anna's Hummingbirds (Calypte anna) - Native Breeders. Also historically more of a west coast species; they have also expanded their home range eastwards and can now be found in many U.S. states. Black-chinned Hummingbirds (Archilochus alexandri) - Native Breeders. Another originally mostly western species that can now be found in many easter states, as far as Florida. 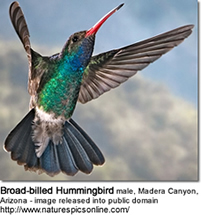 Blue-throated Hummingbirds (Lampornis clemenciae) - Native Breeders in southwestern United States. Vagrants have been reported in many eastern states. The upper plumage is dull green, fading to a medium grey on the underside. It has white stripes behind the eyes and a narrower stripe extending backward from the corner of its relatively short bill, next to a blackish cheek patch. 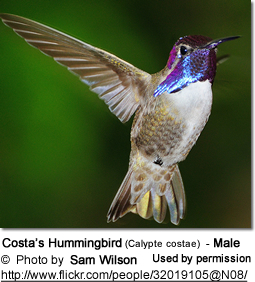 The male can be identified by the iridescent blue throat patch (gorget), which may appear black or grey color in poor light. The female and young have grey throats. Broad-billed Hummingbirds (Cynanthus latirostris) - Native Breeders - These mostly Mexican hummingbirds venture into the United States regularly; they mostly visit the southern parts - but a few vagrants travel as far north as Wisconsin. The male is glossy green above and on the chest. He has a deep blue throat. His straight and slender beak is red with a black tip. His slightly forked tail is dark above, and the under tail feathers are white. The female is less colorful than the male. Her throat, chest and belly are light to medium grey. She has a white stripe over each eye. 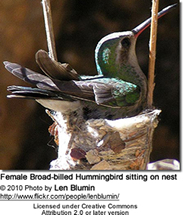 Broad-tailed Hummingbirds (Selasphorus platycercus) - Native Breeders. - Migratory hummingbirds. 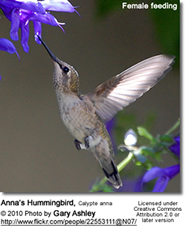 They migrate through eastern California and nest in central California in mountain forests and meadows. Move south to winter in Mexico, Guatemala and, occasionally, El Salvador. 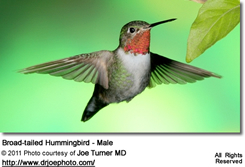 Males can most easily be identified by their iridescent, rose-red throats, white chest feathers and metallic green back and crown and their rounded tails. The males' tails make whistling noises in flight. Females lack the flashy throat patch of the male and are mostly pale below. Their white-tipped outer tail feathers are rust-colored close to the body and blackish in the center; the tail feathers in the center range from green to blackish. 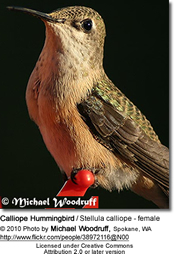 The male's throat is a metallic golden green and the red, dark-tipped bill is straight and slender. Back and head are mostly metallic olive. The lower chest ranges in coloration to whitish with various shades of grey or green, or buffy (yellowish-brown). The tail and primary wing feathers are rufous (reddish-brown) and slightly forked. The underwing is white. Calliope Hummingbirds (Stellula calliope) - Native breeders. Nest in California, migrate south or east for the winter. The smallest breeding bird in North America. The upper plumage of both males and females is mostly a glossy green and below creamy white. Relatively short tail and beak. 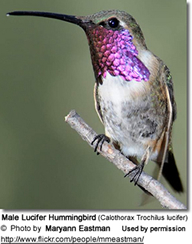 Males have a white throat with iridescent elongated gorget (throat) feathers that form wine-red or purple streaks and -- when erected - show a "whiskered" effect. Females can be identified by their whitish throats with dark streaks. 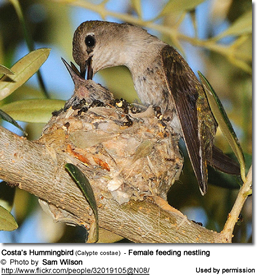 Costa's Hummingbirds (Calypte costae) - Native breeders. These North American desert birds that occur in the western United States to far west Texas, and south to Mexico. But they are known to wander eastward and as far north as Alaska and Canada. Males can easily be identified by the glossy purple crown and long, conspicuous throat feathers that project markedly down the side of the throats, giving it an elongated "moustache" appearance. The back is metallic green. Females have greyish-green crowns (fop of the head) and backs. The chin and the plumage below are whitish, except for some black spotting on her throat. Her flanks are buffy-colored. She has a dark tail with white tips on the outer tail feathers. 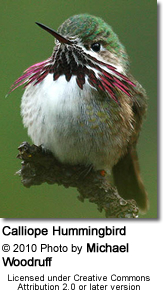 They resemble the Anna's Hummingbirds, but the male's gorget (throat feathers) is longer than that of the Anna's. 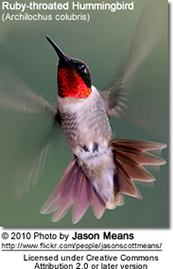 Lucifer Hummingbirds (Calothorax or Trochilus lucifer) - Native breeders ... Occurs locally in southern USA. ID: Large head; long, thin and down-curved bill; small wings and small, tapered body. Tail is long, narrow and deeply forked, extending well beyond the wingtips. Forehead is green and the back is a drab grey-green. They have a pale buffy band across the chest. White streak behind the eyes. 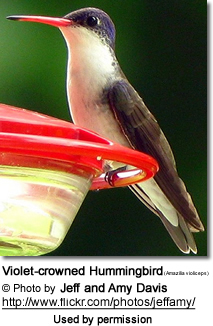 The male has a glossy magenta to blue-violet throat patch (gorget) that is elongated at the sides and is bordered white on both sides (note: the purple gorget looks black in poor light). The neck and the chest are white. The under plumage is whitish / greyish with greenish and rusty sides. The female is larger in size, lacks the flashy throat patch of the male, and is light brown around the chest and throat area. Violet-crowned Hummingbirds (Amazilia violiceps ssp. ellioti) - Native breeders - Occur primarily in Mexico and southwestern to south central United States. 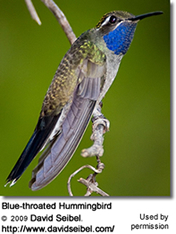 ID: This hummingbird is most easily identified by its white under plumage and iridescent bluish-violet crown (from where it gets its name). The back is emerald green. The tail is dark brown / olive green. The straight and very slender bill is reddish / orangey with a black tip. Females and juvenile birds look similar to the males, but their plumage is generally less colorful than that of the male and they have a lighter and greener crown. 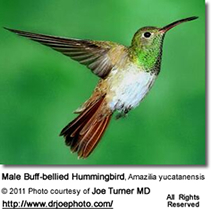 Magnificent or Refulgent Hummingbirds (Eugenes fulgens) - Native Breeders. Found in southwestern USA (mostly southeastern Arizona; to a lesser degree southwestern New Mexico, Colorado, southwestern Texas and Arkansas). Some occur as far west as California and as far east as Alabama and Florida. 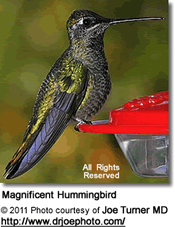 They are nearly twice as large as any other hummingbird species found in this State, and can often be identified by their size alone. The male has a metallic green throat and a black chest. His forehead and crown are purple and the back is dark green. The female plumage is less bright. Her chest is solid grey. Her back and crown are olive green. Her tail feathers are pearl-grey tipped. Buff-bellied Hummingbirds (Amazilia yucatanensis) - Natives breeders ... Their breeding range stretches from the lower Rio Grande Valley of southernmost Texas in the United States through the Yucatán Peninsula of eastern Mexico, northern Belize and northwestern Guatemala in Central America. Some of them winter along the Gulf Coast of the United States from Texas, through to Mississippi, Alabama, Georgia and the Florida panhandle. White-eared Hummingbirds (Basilinna leucotis) - Native breeders - They breed in southeastern Arizona, western and southwestern New Mexico, and west Texas. They have occured occurred as vagrants eastward to Mississippi and Michigan. They could conceivably have reached Massachusetts as well. 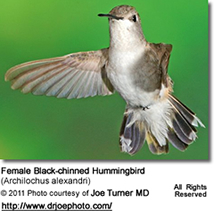 ID: Both the male and female White-eared Hummingbird have a prominent white ear stripe (more boldly colored in the male) for which this species was named. Mostly green above, with whitish undertail feathers. The bill is long, thin, straight and red at the base. The male can be identified by the turquoise throat, turquoise and white spotted chest and flanks, a deep green back, a white abdomen and chest and the wide violet-blue band on a short, thin red and black bill. The female's throat is white or cream colored speckled with green. Her abdomen is whitish; her crown is deep green and her back is drab green. 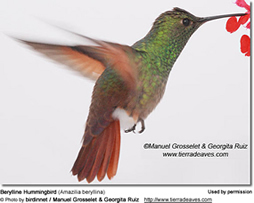 Berylline Hummingbirds (Amazilia beryllina ssp. viola) - Nesting vagrants and local summer resident in Arizona, New Mexico and Texas. ID: They have shimmering green feathers from their bill to their rump, where the color changes to rufous and extends through their tail feathers. The tail feathers have a shiny, iridescent purple tint that blends with the rufous color. 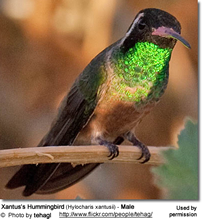 Xantus's Hummingbirds (Basilinna xantusii) - Vagrants / some breeding. This Mexican hummingbird has been venturing into southern California on a regular basis and some nesting activities having been reported. Some travel up the Pacific coast of North America to British Columbia in Canada. Please Note: The articlesdirec or images on this page are the sole property of the authors or photographers. Please contact them tly with respect to any copyright or licensing questions. Thank you.